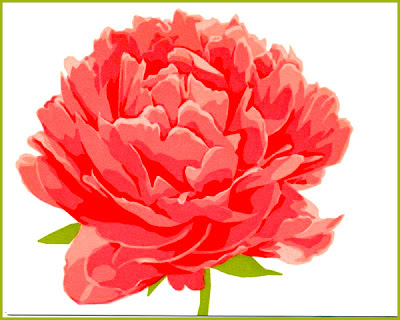 The peony is seen often in Chinese art as a yin symbol of feminine power. It's been one of my favorites for decades. It was part of my logo for Floribunda, a resale clothing store I owned with my sister in the 80's. To me, the peony is the fully-bloomed, open receptivity of yin. Life in full bloom - lush and juicy. Above is a letterpress card, published by pie bird press, of a peony. Another gesture of love from my birthday week. This is a card from another long-time friend, Judy, who blesses me with her sweet companionship, no matter what. Included with the card, a gift certificate to my favorite local restaurant - I will use it to have lunch with this very same friend! She absolutely knew I would swoon over this salmony-pink color - it's something you can almost breathe and taste. I've had it propped in a picture frame so I get a charge whenever I walk by. I love this color.